Three day weekends can be a hit-or-miss in terms of restaurants. Any given venue could embrace the holiday in one of two ways: 1) Be open and ready for the incoming flock of customers, or 2) Close up shop and take a (most likely much-needed) rest day. Luckily for me and my friend Brian, today Curry Village opted for the former option. Brian and I have a bit of a tradition where we meet to come to Curry Village for their delicious curry buffet, and today did not disappoint. My first plate from the buffet consisted of (clockwise from rice), the classic Chicken Tikka Masala, some mixed greens for good measure, and a Tofu Veggie Curry. 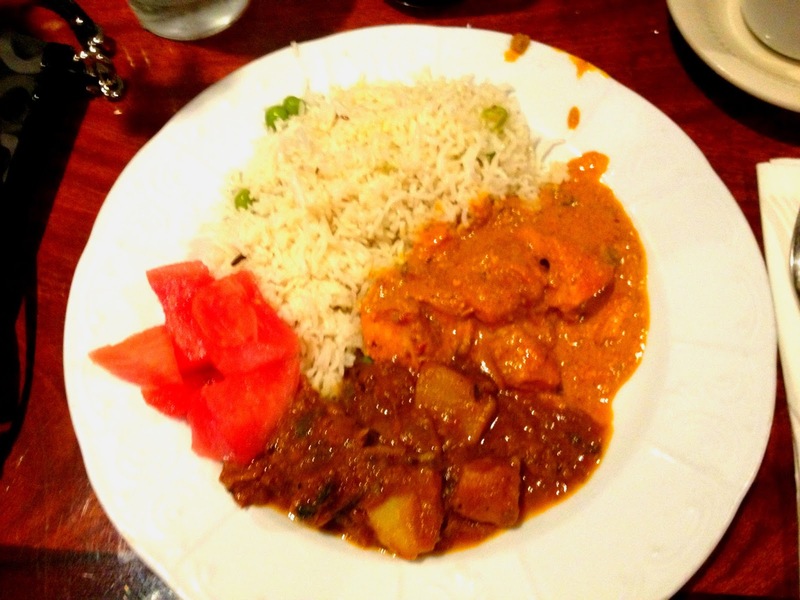 The Tikka Masala was amazing as usual – great hot temperature with mild spice, almost sweet, and the chicken pieces were fairly large – no skimping here. I could honestly eat this for DAYS. This is my answer to the tropical island question, If you were stuck on a tropical island and could only have one food for the rest of your life, what would it be? 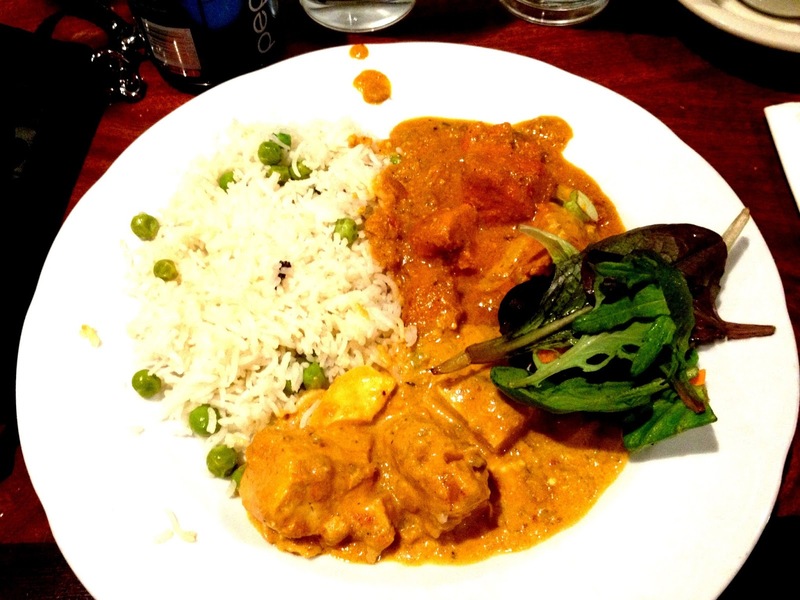 Chicken Tikka Masala, hands down. Great taste, protein from the chicken. Too good. The Tofu Veggie Curry wasn’t spectacular in my opinion. To me, the soft tofu is an odd texture to have in curry. I’m used to having heartier food textures to juxtapose the milky sauce of each curry, be it chicken, lamb, or potatoes. 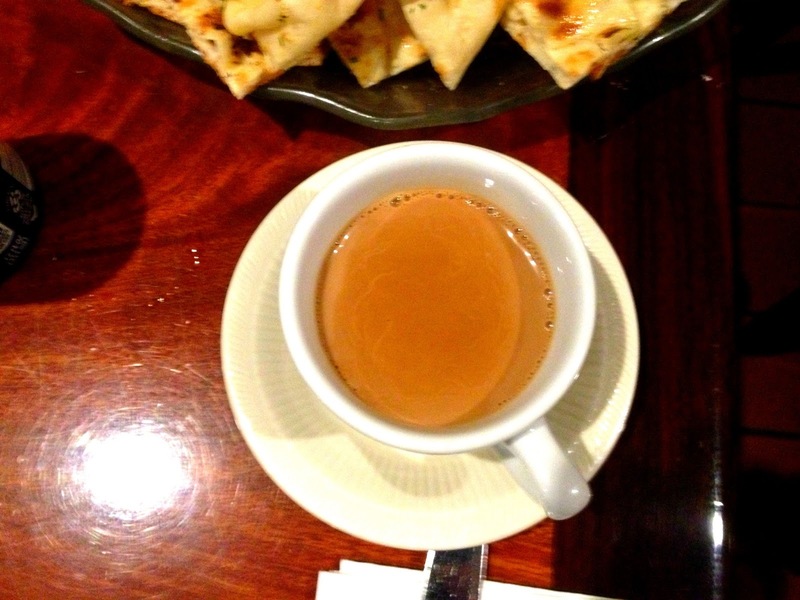 The naan at Curry Village might just be perfect. And not just because it’s free (most Indian restaurants will charge $1 per naan). Even if you don’t order the buffet it’s free here. I know this because before I discovered the buffet I naiively ordered a single entree for only a couple dollars less than the buffet (which is about $11 for lunch and $15 for dinner)! 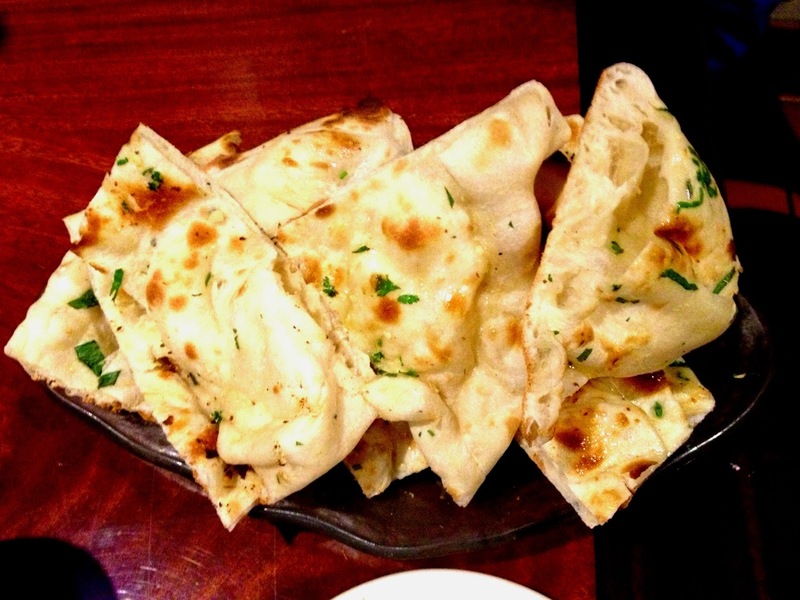 They are generally good at keeping the naan coming without you having to ask for it. Once it arrives, it has been seasoned with garlic butter and each piece is always as fluffy as a cloud. There are never any burned, carcinogenic corners here like you see at some other establishments. It is also worth noting that they give you tin foil at the end of your meal to take home the rest of your naan. It is great reheated as leftovers later. The milk tea (also free), is another nice touch. It is refreshing and gives you a bit of much needed caffeine after eating all those carbs. For my second course, I made sure to get more Basmati Rice, which with it’s sprinkling of green peas is great to mix in with the different curries. I also made sure to nab another helping of Chicken Tikka Masala. I wasn’t kidding when I said I could eat this for days. The dark brown curry you see on the bottom of the plate featured above is their Lamb Vindaloo, consisting of lamb naturally, as well as big hearty pieces of potatoes. This is also amazing, and probably my second favorite curry here. I did notice that there was hardly spice in it this time, which I don’t mind because I prefer milder curries, but it do remember it having a bit more spice/flavor in the past. Maybe it was an off day. You can see I also put some watermelon on my plate this time, so crisp and refreshing next to all the rice, naan, and curries. 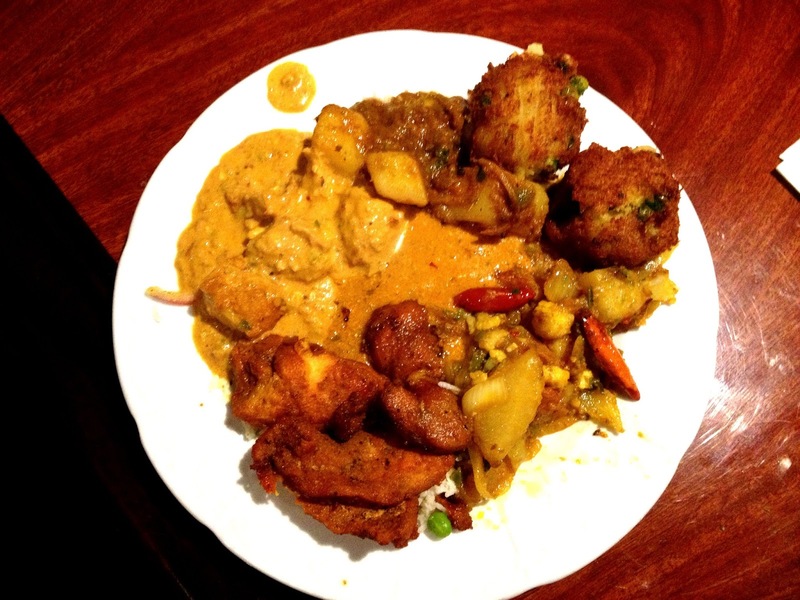 My friend was adventurous and got (from top, dark brown): Lamb Vindaloo, Fried Potatoes, Aloo Gobi, Fish Tandoori, and the Tofu Veggie Curry. He also claimed that there were tater tots in the tofu curry, which I didn’t believe until I looked at this picture. The tofu curry is the lightest curry you see above, on the top-left. To the right-most side of this curry you can make out the texture of what could really be a tater tot and does not look like tofu. So who knows? He enjoyed the mystery tater tots either way. For dessert we tried the prettiest ice cream! I was really excited for it and for more watermelon. I’m always excited for watermelon. The host told us that the ice cream was blueberry flavored, and while we did find what looked to be blueberries in the scoops (you can sort of see one on the far left), the flavor had us guessing. At first we couldn’t quite place it. It was definitely a super sweet, candy-type flavor. Was it cotton candy? No. Starburst? Not quite. Then we got it. 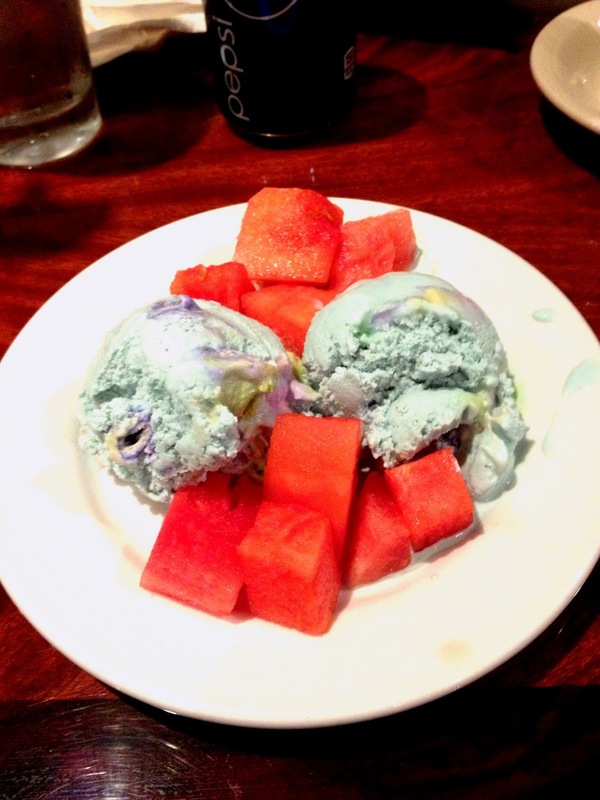 The ice cream was absolutely an overpowering bubblegum flavor. The old school, pink chewy bubble gum that lasted forever. It was weird to me to be eating something with such a strong bubble gum flavor, because the smell and taste of bubblegum tells every part of my brain to NOT swallow that food! From a very young age we are taught that bubble gum will stay in your system for 7 years if you swallow it. Whether that’s true or not, it’s ingrained in us to not digest that flavor! So while I fully appreciated and enjoyed looking at this interesting ice cream, it was not my favorite flavor. 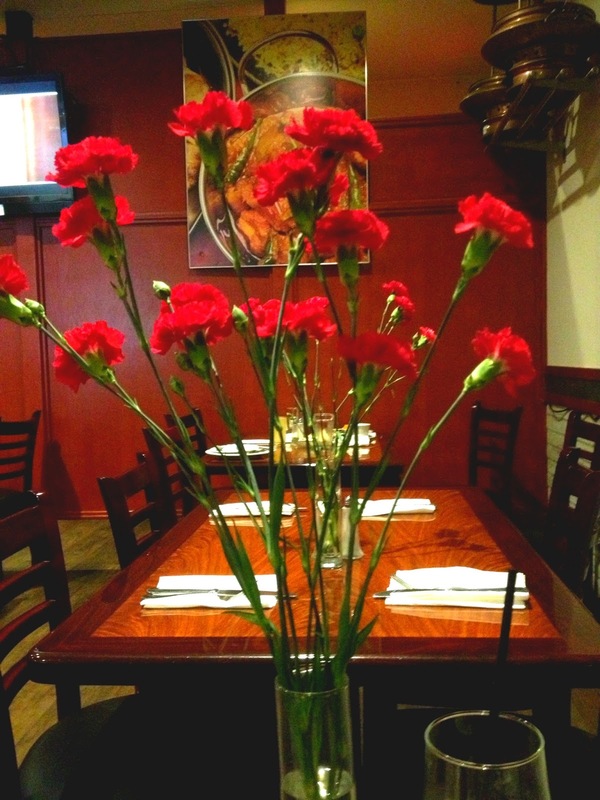 The ambiance in Curry Village is really great – everything always seems spotless when I’m there, and this time they even had carnations at every table! Little touches like that can really make a difference in your dining experience. They have a few HD tv’s on the walls that are always playing fun Bollywood music videos, so you get that fun experience as well. They turn the music way down or even on mute, though, so it doesn’t interrupt your conversation. I must also mention that the walls of Curry Village are filled with SF pride. 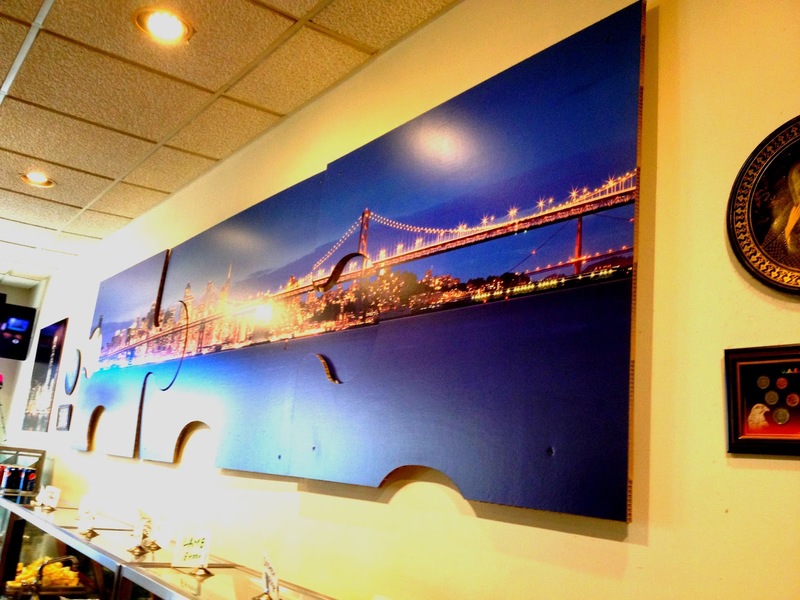 My favorite is this giant jigsaw artwork of the city skyline and not only the Bay Bridge but the Golden Gate as well. Touche, Curry Village Buffet. Touche. Are you curious about a particular restaurant? I’d love to see your best SF restaurant recommendations! Leave them in the comments or shoot me an email. Previous Post Beyond Deep Dish – Patxi’s Pizza!